Applications of scientific computing for solid and fluid mechanics problems include simulation of virtual materials in visual effects for movies and virtual surgery. Both demand physically realistic dynamics for materials like water, smoke, fire, and soft tissues, with each requiring new algorithms. 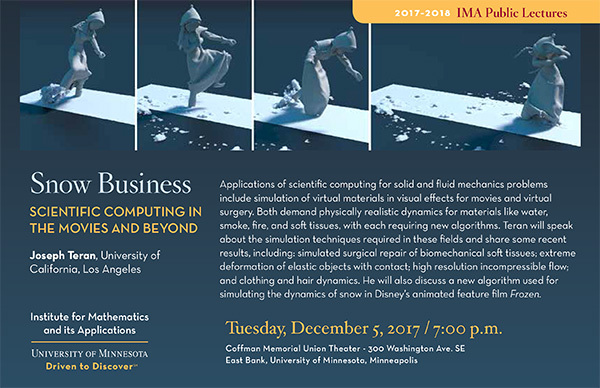 Teran will speak about the simulation techniques required in these fields and share some recent results, including: simulated surgical repair of biomechanical soft tissues; extreme deformation of elastic objects with contact; high resolution incompressible flow; and clothing and hair dynamics. He will also discuss a new algorithm used for simulating the dynamics of snow in Disney’s animated feature film Frozen.